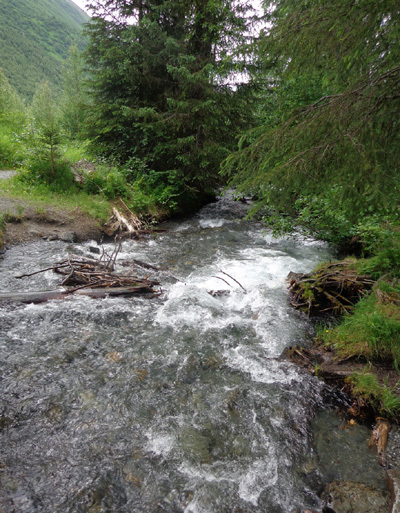 sometimes appear on the river to scoop salmon from the water." 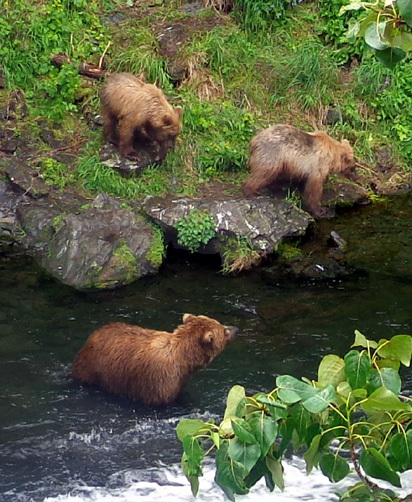 Yesterday I was able to watch a mama grizzly bear and her two cubs fishing at the bottom of the falls for salmon, the first time I've witnessed this iconic scene. It was a thrill. 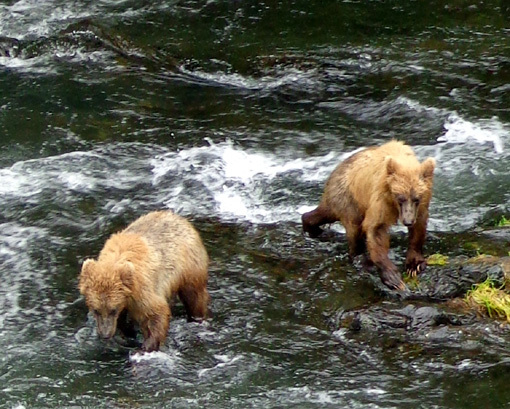 Mama Bear (in the water) and her two yearling cubs head for the river to fish. 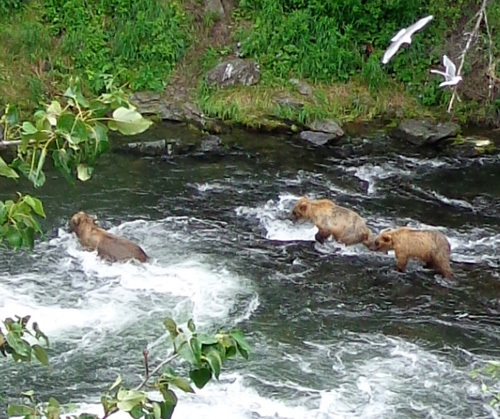 It was also fun to watch the salmon leaping upstream and to see birds hovering nearby to catch weak or dead fish or to scavenge the scraps left by the bears. We hiked and/or cycled part of the Russian River Trail both yesterday and this morning from our campground. 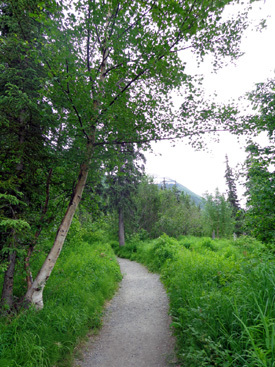 At a fork in the trail a spur goes down to the falls. 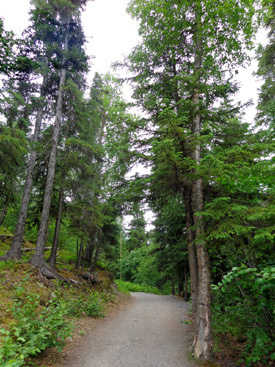 The main trail continues past the Lower and Upper Russian Lakes and ends at Cooper Lake, a distance of 21 miles point to point. 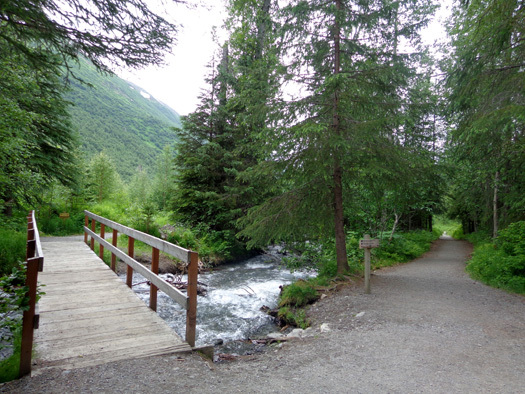 It also connects the Resurrection Pass and Resurrection River Trails, allowing a 72-mile traverse between the towns of Hope and Seward on part of the old Iditarod Trail. This entry focuses on the 2� miles of trail to Russian River Falls and includes photos from both days. 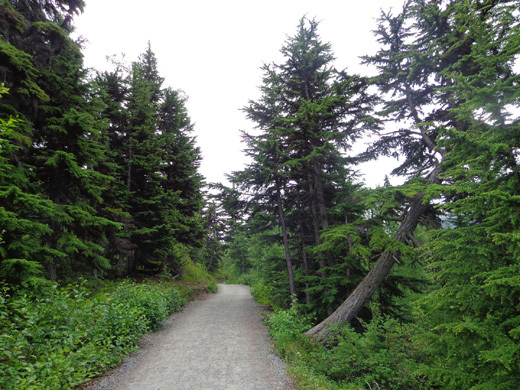 I'll show photos of the other part of the trail to Lower Russian Lake in the next entry. 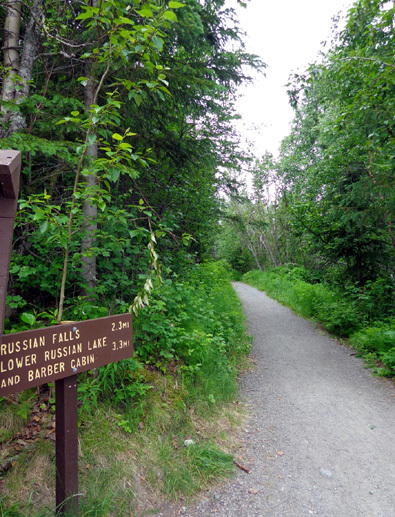 My goal yesterday was a three- to four-hour hike with Cody on the Russian Lakes Trail. 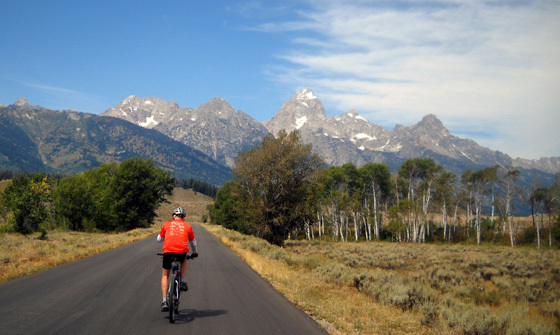 I saw Jim riding his bike through the campground loops and explained my mistake. He offered to drive Cody and me to the correct trailhead to save a little time. I encouraged Jim to take his bike in the back of the truck because the Russian Lakes Trail is open to cyclists. He was game to try it. We returned to the camper to get the truck and parked in the last available space at the upper trailhead parking area. 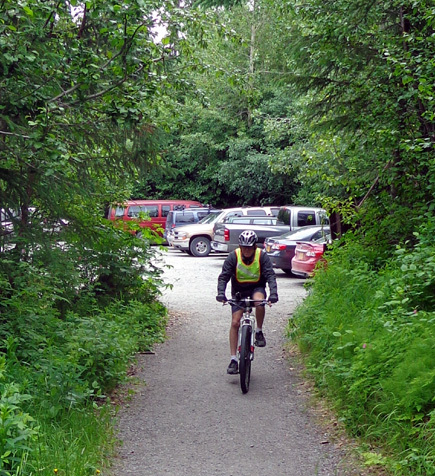 Jim starts his ride yesterday from the upper trailhead parking area. 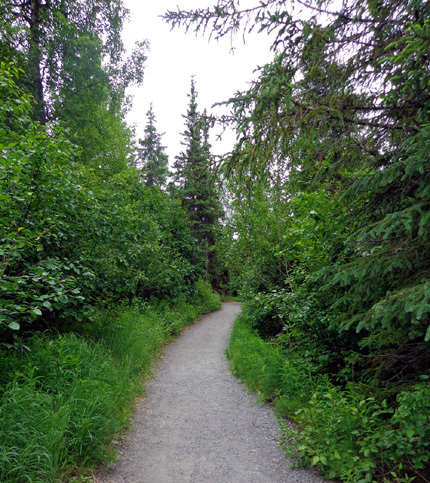 The part of the trail that goes to Lower Russian Lake and beyond is more narrow (mostly single-track) and less smooth. 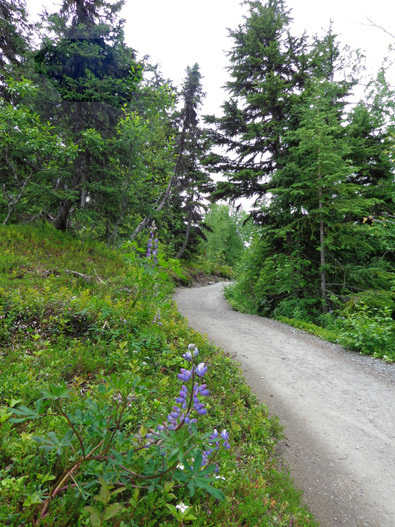 There are lots of good views into valleys and toward snow-capped mountains, an unexpected view of a glacier in the distance, and some flowers, ferns, and other interesting groundcover plants along the way. Jim rode ahead of me to the falls, turned around and rode back to the bridge, crossed the river, and headed to the lower lake. When he didn�t run into me he figured correctly that I hiked to the falls first. 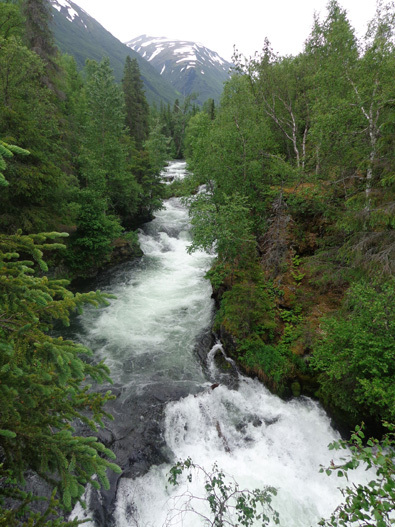 I�m glad I did because I caught the tail end of that classic Alaska scene with a mama bear and her two cubs fishing below the falls. 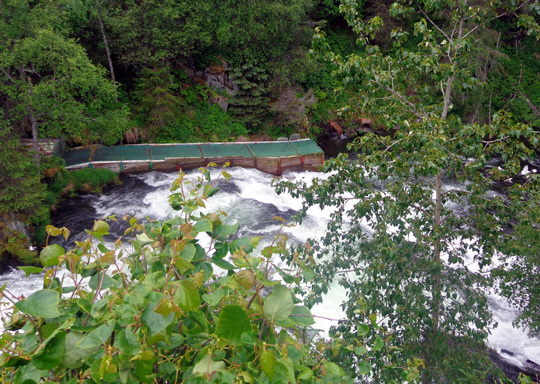 There are two large wooden decks overlooking the falls, the perfect place to watch the salmon, birds, and bears. 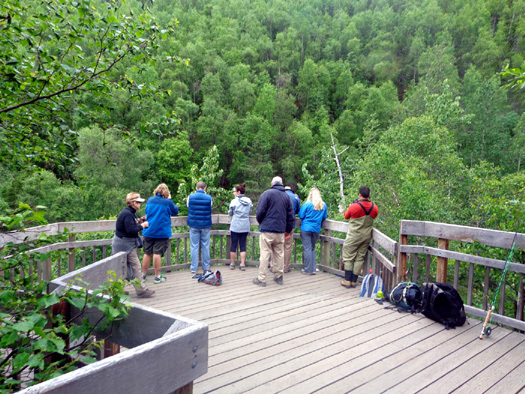 When I went over to the second deck I saw these eight people intently looking at the river flowing below them. 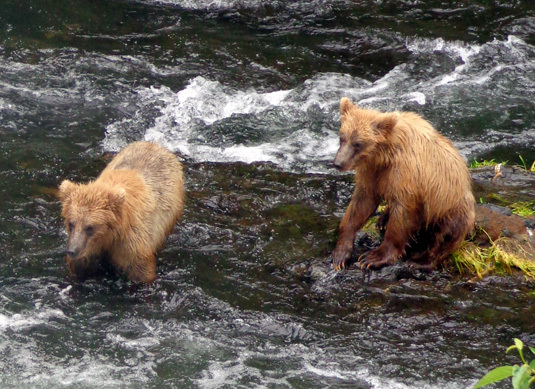 They had just watched a female grizzly bear catch a salmon! 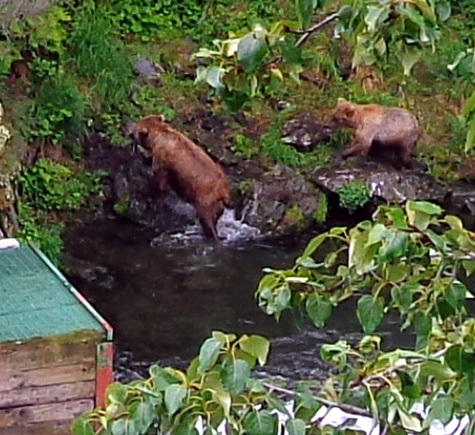 Above and below: the bears are just to the right of the fish weir. 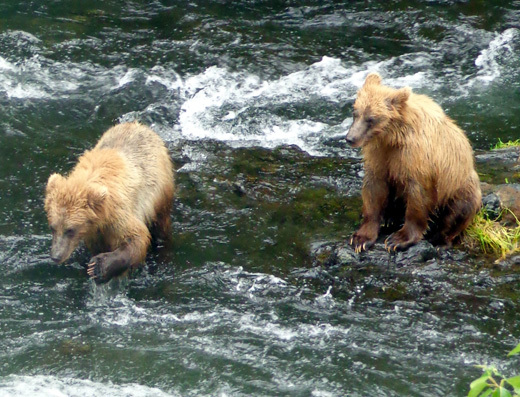 Mama Grizz is on the left and one of her two cubs is on the right. Everyone was hoping the bears would come back for more. I was able to see both cubs clearly for the next five minutes. Grizzly cubs remain with their mothers for three years. These are too big to have been born this spring but they aren't very good at fishing yet so I'm guessing they are a little over a year old. Once again Mom was watching her cubs, this time making sure they were following her. 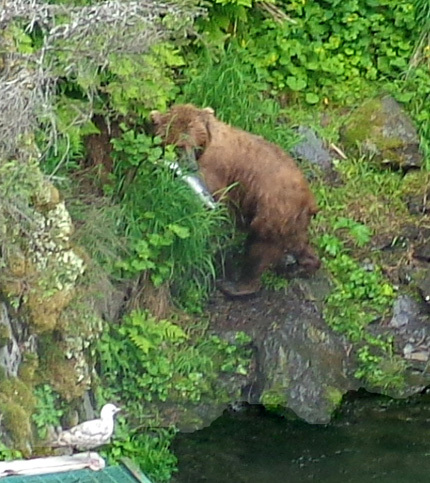 Note the bird that was brave enough to perch on the end of the weir while the bears were still close. The first time I saw the bears there were no birds in sight. Shortly after the bears disappeared into the woods Jim came back to the falls on his bike to see if I was there. 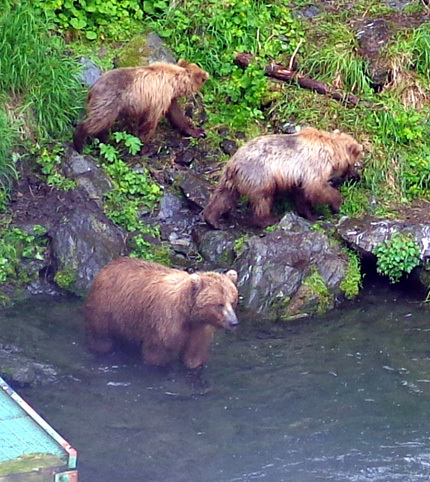 We waited around for several minutes but the bears didn�t return while we were there. I'm sorry he didn't get to see them.